The League of Extraordinary Gentlemen (2003) is an action-adventure superhero movie adapted from the comic book series of the same name. Set in the late 19th century and in an alternate Victorian Age world, this movie features an assortment of fictional literary characters from the works of famous English writers such as Jules Verne, Bram Stoker, Sir Arthur Conan Doyle, Oscar Wilde, Edgar Allan Poe, Mark Twain, and some others. Synopsis: Renowned adventurer Allan Quatermain (Sean Connery) heads up a "league" of extraordinary people with superpowers to battle the technological terror of a villain known as "The Fantom", finally revealed as Professor James Moriarty (Richard Roxburgh), the nemesis of Sherlock Holmes. 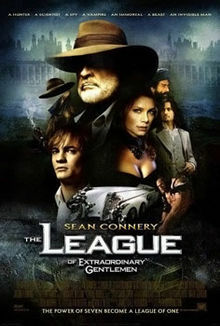 This "League" comprises Indian pirate/seafarer Captain Nemo (Naseeruddin Shah), chemist/vampiress Mina Harker (Peta Wilson), an invisible man by the name of Rodney Skinner (Tony Curran), American Secret Service Agent Tom Sawyer (Shane West), the evil and ageless Dorian Gray (Stuart Townsend), and the infamous Dr Jekyll/Mr. Hyde (Jason Flemyng). If you're well-read and familiar with the Victorian age characters, then you'll find this movie very, very interesting, especially if you're able to identify them. In my opinion, the idea of assembling legendary personalities from literary fiction as a team/league to combat villains is really ingenious and extraordinary. In fact, this movie reminds me of Watchmen (2009), another similar movie but darker and gloomier in nature.